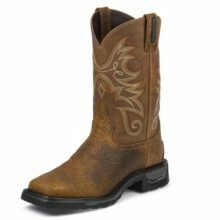 The Sierra Badlands Waterproof is an 11-inch tall TLX® Western Work men’s pull-on work boot that features a distressed golden brown leather exterior with subtle orange, cream, and navy stitching along the upper. 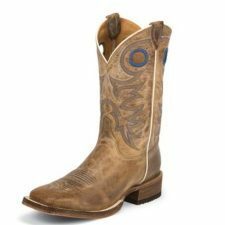 The waterproof leather utilizes high-tech construction of fully-waterproof shells and linings and is crafted to withstand everyday wear and tear. The narrow square toe and TLX®-2 heel allow for a relaxed fit for long days on your feet and the TLX Performance® Comfort Package insole has multi-density foam to give you extra softness and shock absorption. This boot utilizes the XT2™ Anti-Odor Technology that has real silver woven right into the insoles for proven odor protection and is designed with components that will not activate screening devices in high security work environments. Its rubber outsole provides maximum traction on various surfaces so you can confidently step on to any job.